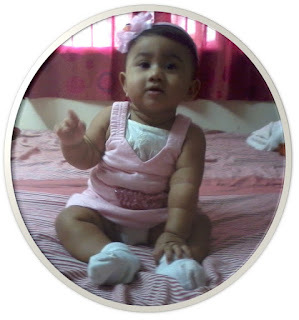 My daughter Anya has her own blog where she writes incidents from her life. I asked her to write a guest post in my blog and she readily agreed to it. When I asked her what she would write, she told me that she will write about her first train journey. 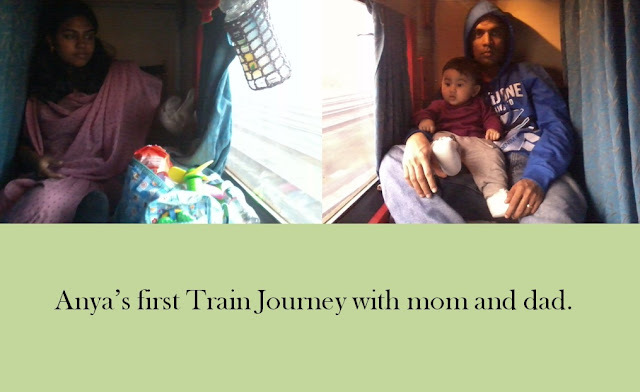 Literally it is not her first train journey; but the first train journey with her mom and dad and when she could understand what's happening around her. Over to Anya. I Anya. Baby Anya. I drink milk. Smile gigihaha. I say inga. My mom calls me Anya paaappu. My mommy very gentle play with me. My daddy very naughty. He always make noise and create sound in house. December 2012 my papa (dad) and mom took me in a tunnel machine. Mommy said it was a train. It make sound kooo chuku chuku. In train, I sit in daddy's lap and then mommy's lap sometime. One uncle pinched my cheeks in train. Daddy get very angry and shout him. I very happy that daddy protect me from that uncle. After that daddy pinched my cheeks. But I like daddy pinching my cheeks. Mommy give idly, biscuit, milk and orange juice. I drink drink drink. I don't sleep in train. One black dress uncle came. Daddy show ticket. He went away. Daddy say his name is ticket checker. He did not pinch my cheeks. Mommy bring all toys in a bag. I play play and happy. Night I suddenly sleep. Daddy also sleep. But mommy full night awake and sing for me. Morning I awake and daddy awake. Daddy come close to kiss me. But his mouth bad smell because no brushing. I cry loud. Daddy understand and brush the teeth and then kiss me. I smile now.